Death Thrash Veterans JUST CAUSE celebrate 20 Years of brutality SATURDAY MARCH 4TH at LOGANS PUB (1821 Cook St) who ALSO started throwing killer shows back in 1997! ☢ CABAL Metal DJs spinning the best Vinyl between bands! 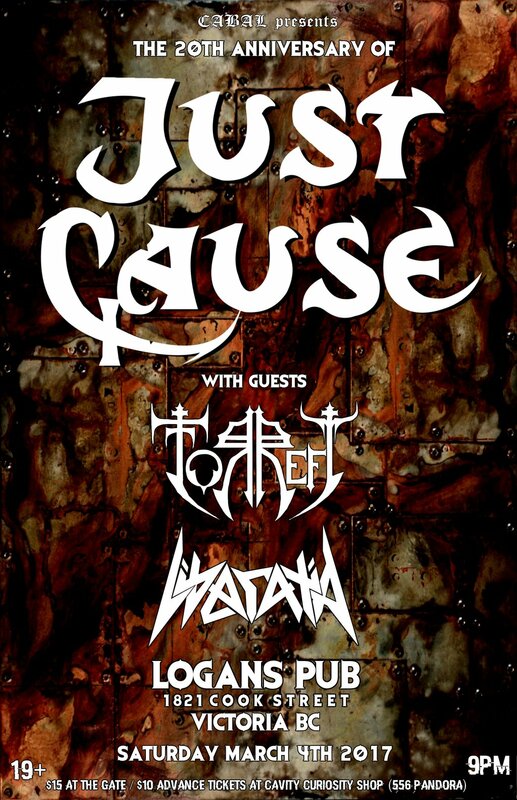 Just Cause is a Canadian Death/Thrash metal band founded by front man guitarist Patrick J. Beaudoin (Punchdrunk,Bloody Worm) in 1997 with the contribution of Drummer Gene Hoglan (Testament, Death, Dark Angel, Strapping Young Lad, Fear Factory) and Bassist Stuart Carruthers (GOLERS, Sub Version, Grip Inc). In 2001 Just Cause released their first full length album F.I.O, the line up featured Patrick & Gene with guests contribution from Rico Forrester and Lorde Heathen (Chris Valagao / Zimmers Hole, West Of Hell). After a ridiculous 10 years hiatus and a new live line up including Aaron Boon Gustafson of ANCIIENTS and Matt Modder ex TYRANTS BLOOD, they are back to celebrate their 20th anniversary and for the first time ever performing in Victoria! THIS WILL BE A LEGENDARY SHOW NOT TO BE MISSED! SEE YOU MARCH 4TH ! !